Charles J. Huneycutt, Jr. was born on June 20, 1943 and joined the Armed Forces while in Charlotte, North Carolina. He served in the United States Air Force, and attained the rank of Major. Charles J. Huneycutt, Jr. is listed as Missing in Action. Name: Charles Jerome Huneycutt, Jr.
rear-seater, First Lieutenant Charles J. Huneycutt. Both F4's were tracked to their target area of Dong Hoa in North Vietnam, but because of incliment weather, were directed to an alternate target nearby. Positive radar and radio contact was maintained with the aircrafts until the point when their bombing dives were to begin. All contact was then lost. 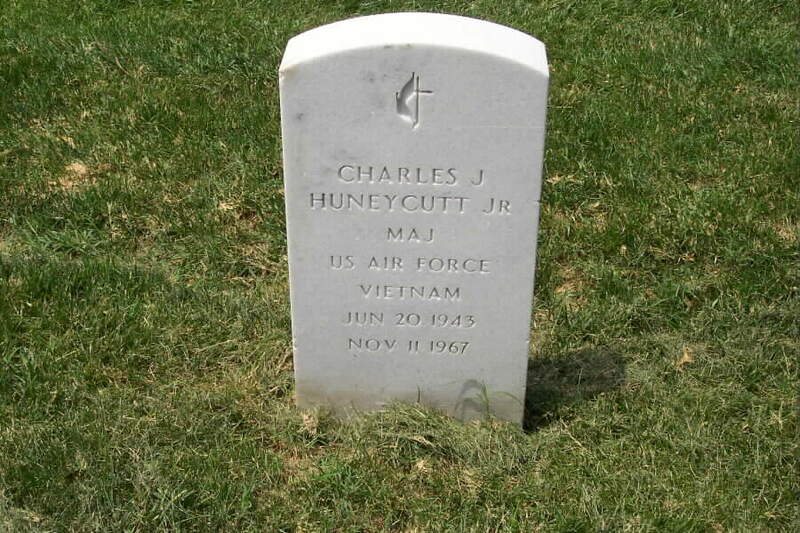 Families, Charles J. Huneycutt survived his loss incident. In the Peace agreements signed in Paris in 1973, the Vietnamese pledged to release all American prisoners of war and account for the missing. They have done neither. The U.S. Government has named the return and full accounting of Americans "highest national priority", yet has dealt with the issue with less than high priority. In 1988, the Vietnamese "discovered" and returned to U.S. control the remains of First Lieutenant Charles J. Huneycutt, Jr. The other three pilots lost on November 10, 1967 remain missing, and the Vietnamese deny knowledge of their fates. For 21 years, Huneycutt was a Prisoner of War - whether he was alive or dead. Since the war ended, nearly 10,000 reports relating to Americans missing in Southeast Asia have been received by the U.S. Many authorities are convinced that there are still hundreds of Americans alive, held captive. Cook, Crew, and Morgan could be among them. They and the others who remain missing deserve the full effort of their country to bring them home. Kelly F. Cook was an instructor at the U.S. Air Force Academy prior to volunteering for Vietnam service. James A. Crew graduated from the U.S. Air Force Academy in 1965. James S. Morgan's wife, Eleanor died of cancer in 1985, not knowing the fate of her husband.